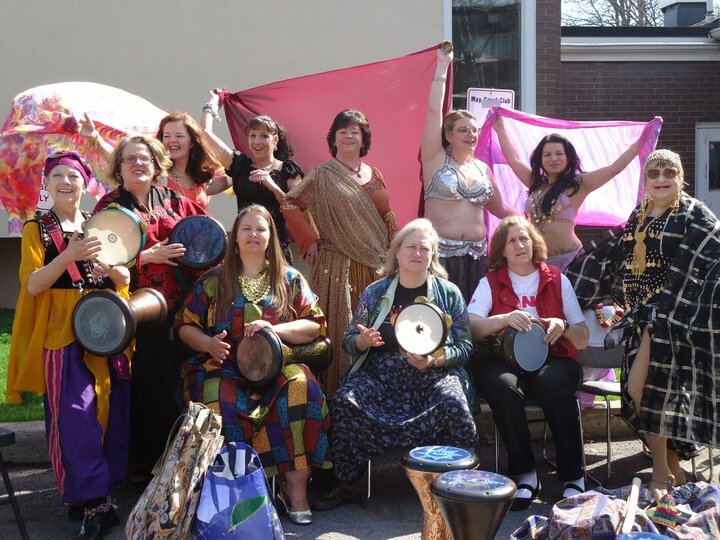 Ottawa Souk, with Jocelyne Jehane Khan and Lisa-Marie Seraphin, present a new event, called “Shimmy Sangha”. Friday, October 6th, 2017, from 7 – 9:30 p.m., at Studio X Ottawa, 250 City Centre Ave., Unit #122. “Sangha” means community in Sanskrit, and that means it’s time to dance, ladies! 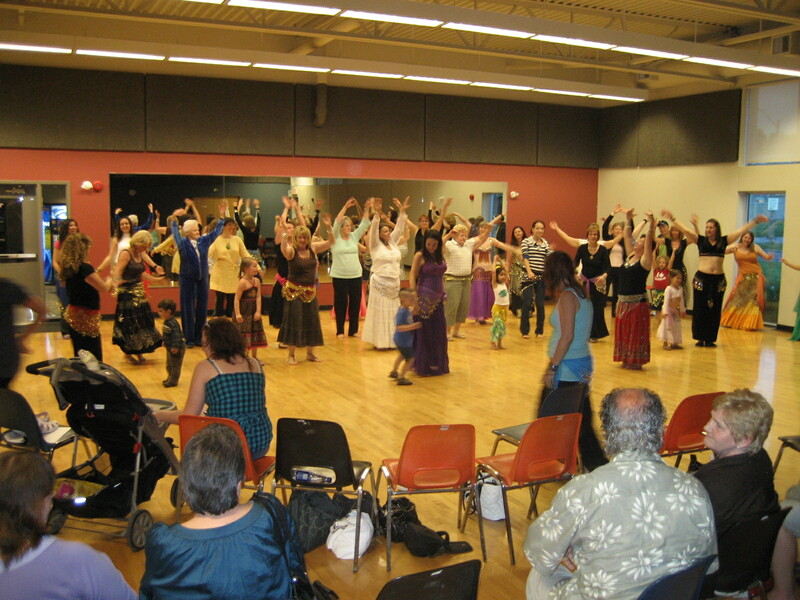 Come on out for an evening of fun, without the pressure to perform, and enjoy fabulous Middle Eastern music, practice your moves, and maybe even learn some new stuff. Studio X is a lovely, centrally located dance studio, with plenty of parking. Wear something comfortable, and don’t forget your water bottle. Please note, no other food or drink allowed inside the studio (thanks). The cost to attend is $10. Ticket info and advance sales info coming soon…stay tuned…everyone welcome! I’m very pleased to be performing at this local event, with student dancer Zahara, to represent our BCA Amala troupe; dancing will be headlined by Halyma and the Belly Dancing For Fun troupe. 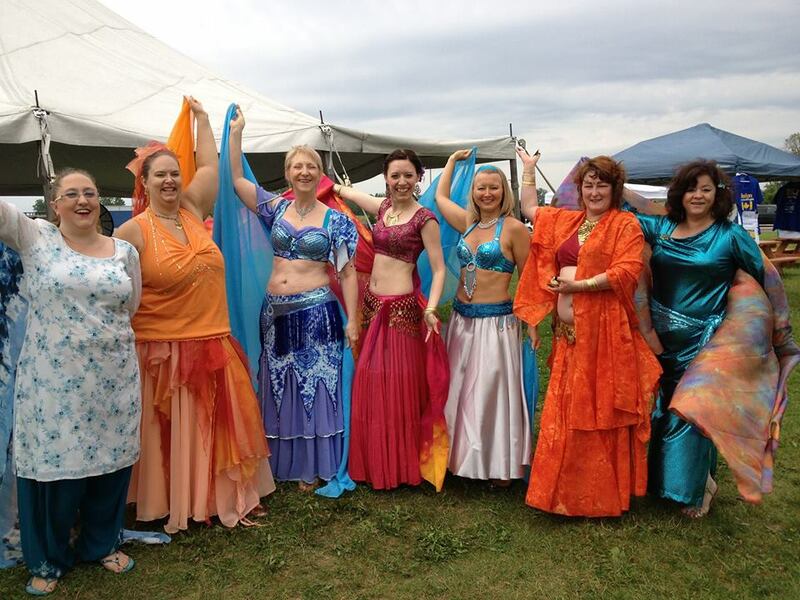 We LOVE to dance outdoors, and help out with community fundraisers; so the Ottawa belly dancing community is pleased to volunteer at the Ottawa Race Weekend this year…and you’re invited!! We’ll be set up at a cheering station along the runner’s route, in a colourful oasis tent, with our own change room. Great music, free-style dancing, with drums, zills, and making lots of noise, in our family-friendly bright sparkly costumes, as we cheer on the participants in their journey to raise money for various causes. So, set your alarm clock, grab a travel mug with your favourite morning beverage; bring your BFF, toss your hip scarf and lipstick in a tote bag, and come join us! Dancing starts at 7 a.m., and we’ll be located at the corner of Sherwood and Fairmont streets, just off Carling Ave, between Dow’s Lake and the General Hospital (see map). **NOTE: We may relocate just up the street in Fairmont Park to ensure safety from traffic if our station gets too popular, but we’ll be easy to find! Need more info? 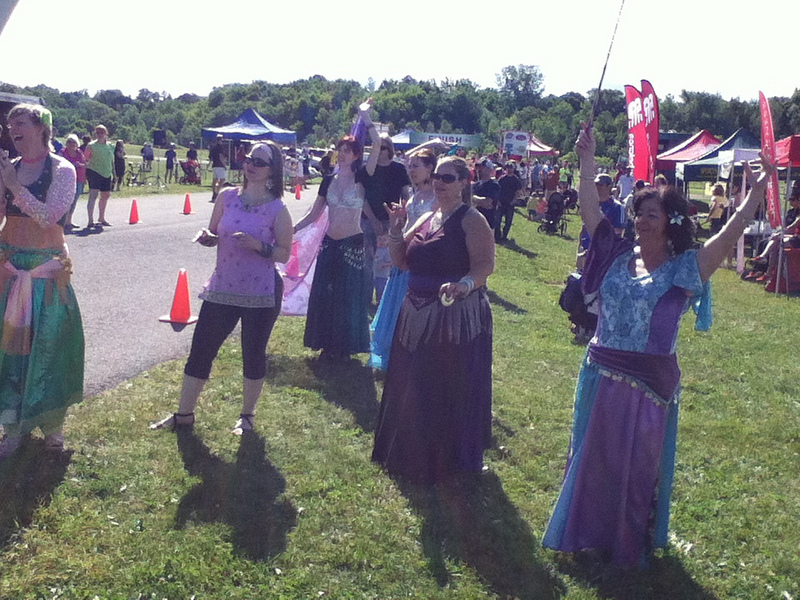 Contact me at: fatcatbellydance@gmail.com We’d love to have the biggest, brightest, and most enthusiastic cheering station along the route! Wow! It’s a big new show, and I’m very excited to have my students perform. This event will be held on Tuesday, June 21st, 2016, at Centrepointe Theatre, on 101 Centrepointe Drive, Ottawa. Doors open at 6:30, and the show starts at 7 p.m. Tickets are $10 each, and are available through teachers, like me. Performances will include student groups, and professional instructors/performers; dance styles will range from belly dance, Bollywood, Tribal, Fusion, and theatrical. It’s an opportunity for all of us to show off our hard work in class, and provide a great evening of entertainment. 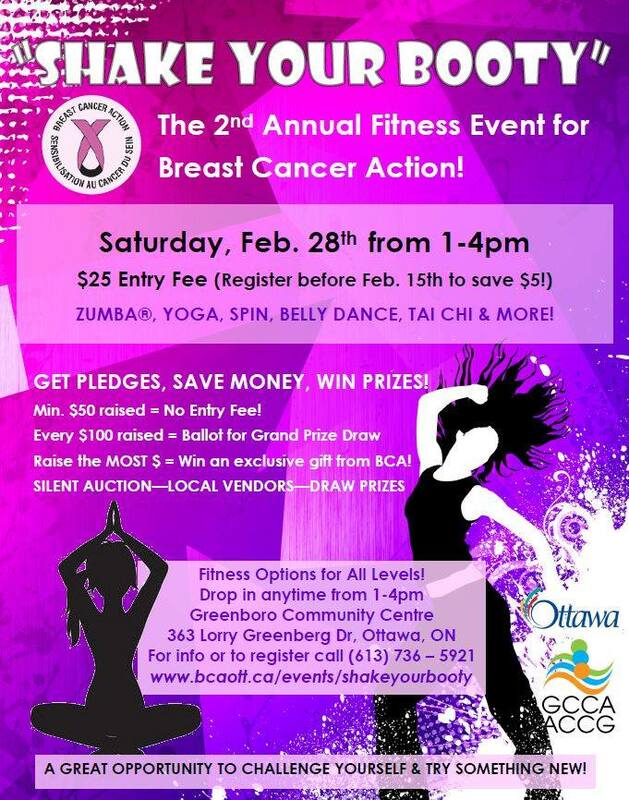 Proceeds will benefit Breast Cancer Action Ottawa’s programs for survivors. I’m very proud to be a volunteer instructor for BCA’s “Fit and Fab” program, and you can read all about the beneficial services they offer, at: http://www.bcaott.ca So come on out and enjoy a lovely evening of colourful costumes, wonderful music, and artistic expression put on by dazzling divas, as we shimmy and smile for a great local cause. Hope to see you there! Shopping, Shimmies and Smiles!! Come on out for a great Sunday afternoon event. I’ll be there all day – happy to answer any questions you may have about what to choose for your first costume or accessory purchase. Something sparkly for everyone’s budget! 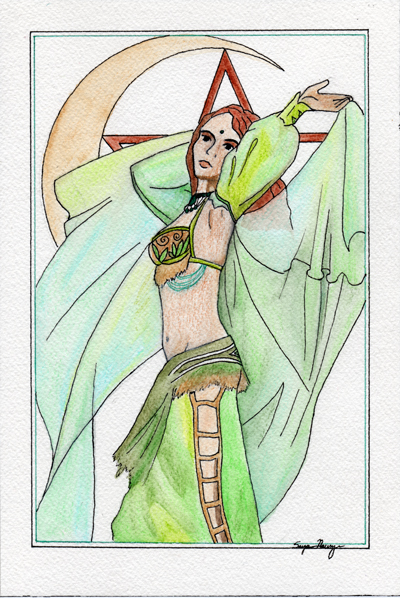 To register for my 4 p.m. one-hour beginner workshop, contact fatcatbellydance@gmail.com Hope to see you there! Dedicated divas practicing hard for Shimmy Mob! 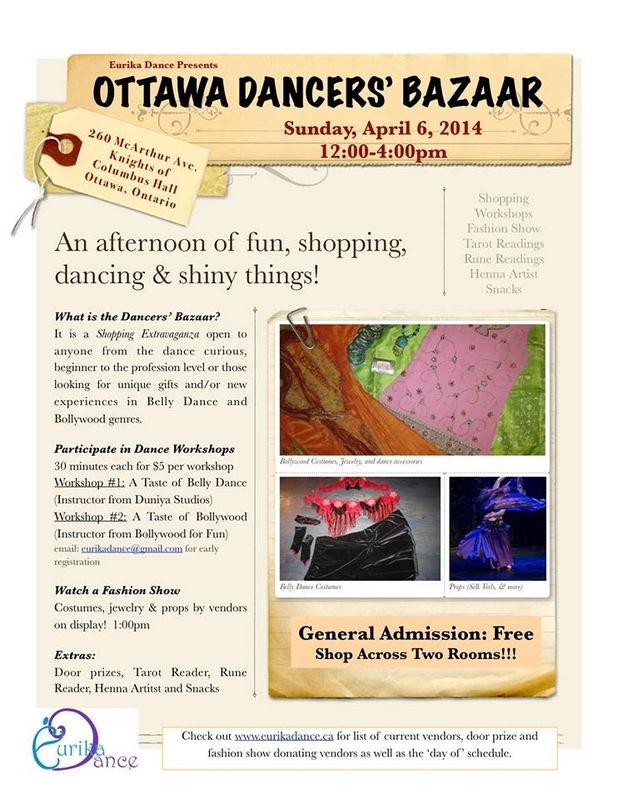 Saturday, September 27th, 2014: Calling all dancers! Put on your pretty coin scarf, and join Halyma’s Belly Dancing For Fun troupe, as we free-dance, shimmy and smile in the great outdoors, in support of participants at the Epic Walk for Cancer Care. Our cheering station will be set up on the front west side of the War Museum (1 Vimy Place), near the river pathway. Dancing starts at 10:30 a.m., till 1:30 p.m., rain or shine. Need costume accessories? Contact me, and I’ll hook you up, girl! This is a great opportunity for newer dance students to perform in public, without the pressure of learning a structured choreography. We’re there to offer positive energy and support to these brave survivors, their family and friends along their journey…so don’t be shy…come on out and dance for a good cause! This event is scheduled for Saturday, September 27th. The walk starts at Brittania Park, and finishes at the MapleSoft Centre; mostly following the Ottawa and Rideau rivers, with short distances going through downtown and Old Ottawa South. Funds raised will be invested in local cancer care, including equipment and programming at the Cancer Foundation, Queensway Carleton Hospital, and Bruyere. Two awesome events taking place next Saturday, June 21st, 2014…it’s gonna be a busy day!! First…come out and join us, as we cheer on Canada’s finest female athletes, competing in honour of olympic runner, Emilie Mondor, at the annual “Emilie’s Run”. This event is held at the Canadian Aviation Museum, at Rockcliffe and Aviation Parkway. Racing starts at 9 a.m., with a 5km run, half marathon, and kids race. 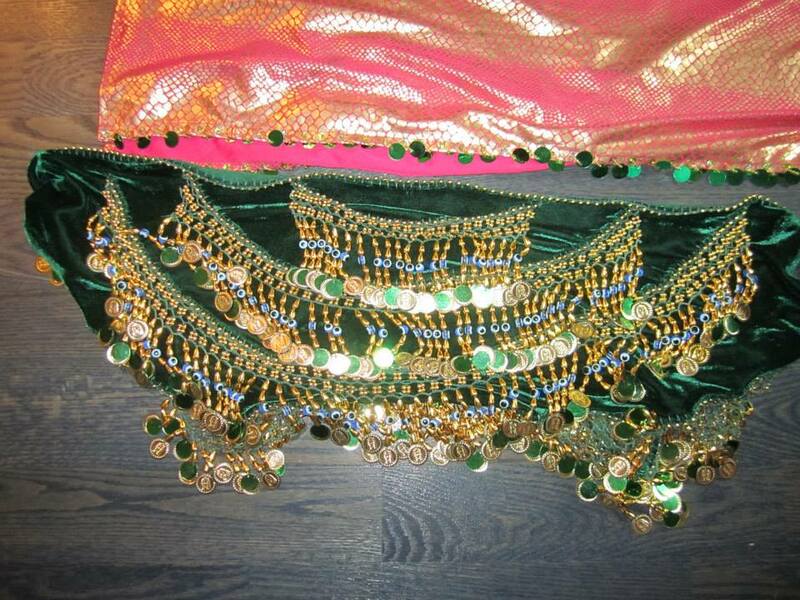 Halyma’s Belly Dancing For Fun, and Bollywood For Fun troupe members will be there in all our shiny, glittery, jingling attire; to entertain participants, family and friends after the races. 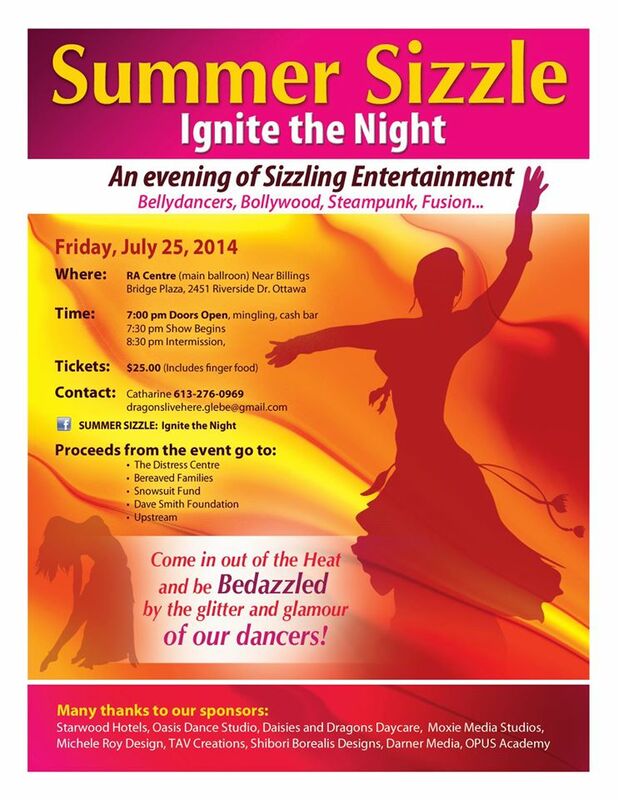 Come on out for a fabulous evening of entertainment, and support a good cause! Come on out to see the beautiful Aziza perform at Topkapi…she’s amazing! Shopping, Shopping, Shopping!!! 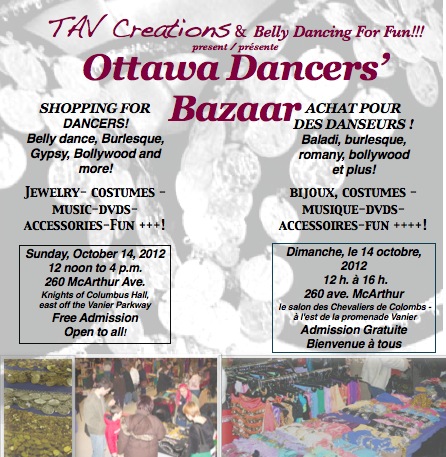 Come to the Ottawa Dancer’s Bazaar – Sunday, October 20th, 2013, from noon till 4 p.m., at the Knights of Columbus Hall, 260 McArthur Ave. Free admission and parking. 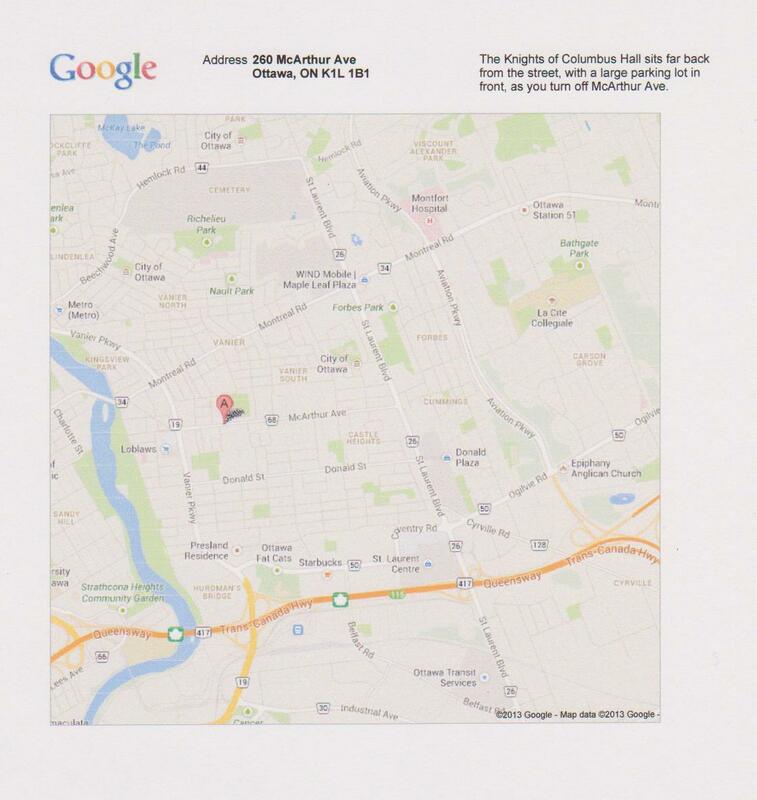 Please see the google map and event poster below. 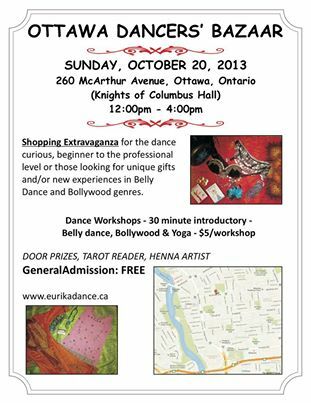 If the printing appears a bit too small, click on the map/poster, then you should be able to zoom in for a closer look..Check the website: www.eurikadance.ca to sign up for super mini-workshops – only $5 each. 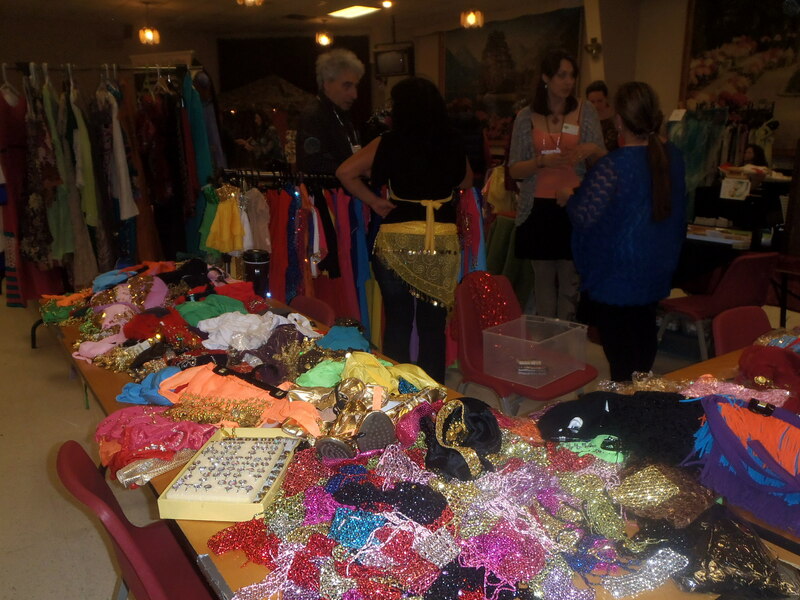 To keep event costs down, most sales will be cash only, and don’t be shy to try stuff on and haggle! ATM on-site. Grab your BFF, put on some comfy shoes, and spend a fun afternoon browsing beautiful bargains…Not sure what to shop for? 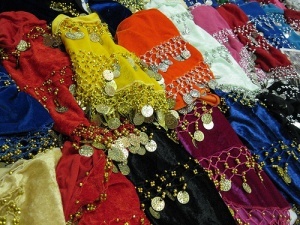 Contact me here at: fatcatbellydance@gmail.com and I’ll offer my best advice; or you can drop by my booth at the bazaar…hope to see you there!! 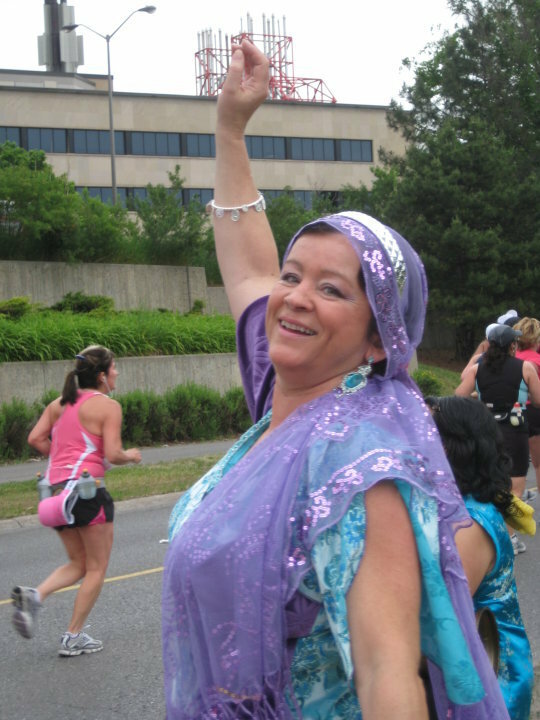 Knights of Columbus Hall, 260 McArthur Ave.
Ottawa Race Weekend May 29th On the race route, you’ll find a large group of sparkly, shimmying dancers and drummers at the Rideau Canal pedestrian bridge cheering station. We’ll be performing for spectators and runners alike, in an effort to share our energy and best wishes with participants, to lift their spirits for the challenge of completing the race. Calling all dancers and students – come on out and join us for some “freestyle” entertainment, to share in the fun and feeling of community spirit! ***************************************************************** Bellydance Fundraiser for Breast Cancer Walk by Zenna This amazing event is scheduled for the evening of Saturday, May 14th, at 7:00 p.m., to be held in a private club at 1214 Chemin Antoine-Boucher, Gatineau, QC Cost: $25 There will be dazzling performances by ladies you’ve seen on my “Diva” page, great music, food, and lots of fun. 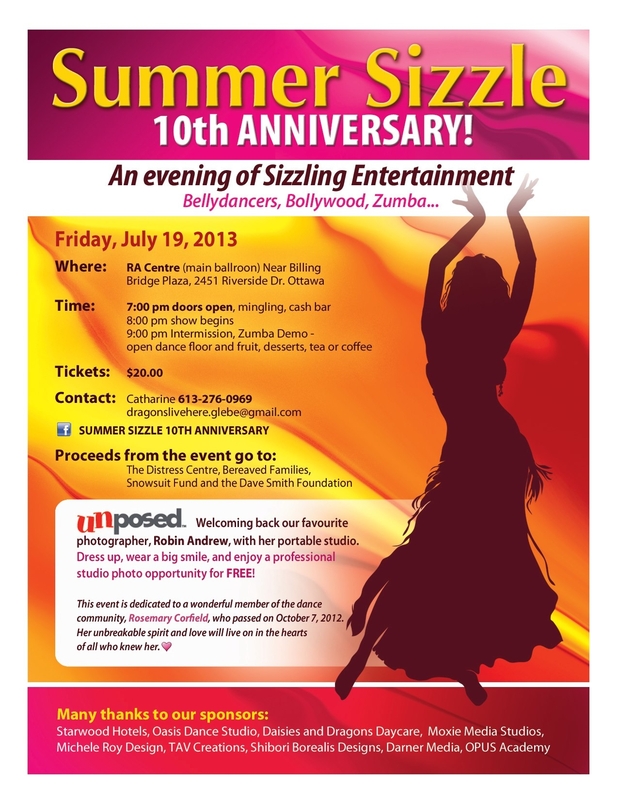 Proceeds will benefit breast cancer programs right here in Ottawa. 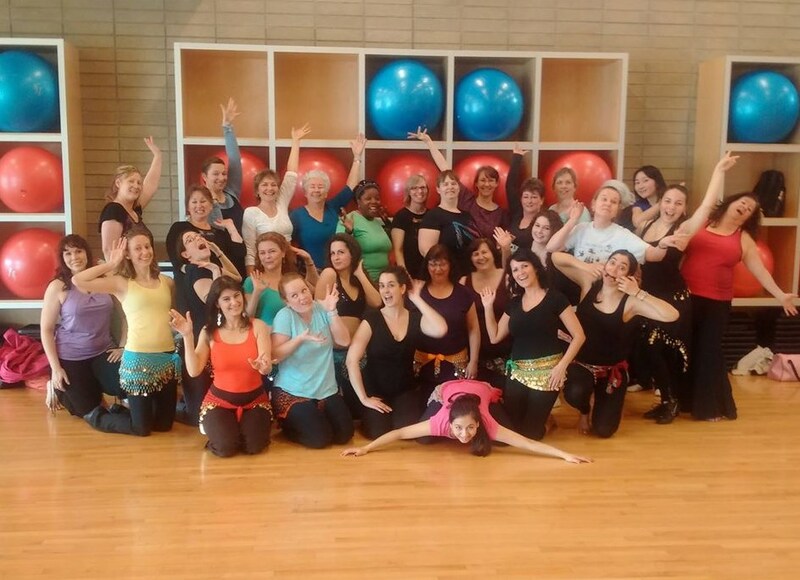 I’m proud to be a volunteer instructor with Breast Cancer Action Ottawa, which allows me the opportunity to teach beginner bellydance to fabulous women. These fitness programs help survivors “get their groove back” and remind them how beautiful they are. Come on out and support the cause! 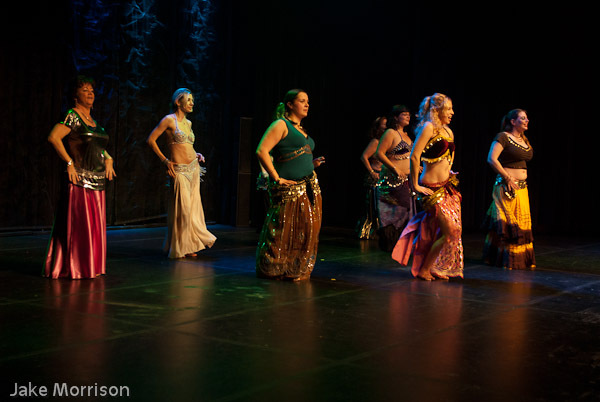 For more info and tickets, please e-mail me by clicking on Contact fatcatbellydance (above my photo on the left side of this screen)…hope to see you there! Directions: Take Island Park Drive and go over the Champlain Bridge to Gatineau. Turn left onto Chemin d’Aylmer. Turn right onto Chemin Allen. Turn left onto Chemin Mcconnell. Turn right onto Chemin Vanier. Turn left onto Chemin Antoine Boucher, and the club will be on the right. 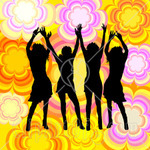 ***************************************************************** Canterbury Class Party – Friday, March 25th, 7:00 – 8:30 p.m. in the dance studio. Special guest performances. Pot-luck snacks/beverages. Family, friends, staff welcome! Fundraiser – to benefit the 2011 Shoppers Drug Mart Walk for a Cure. 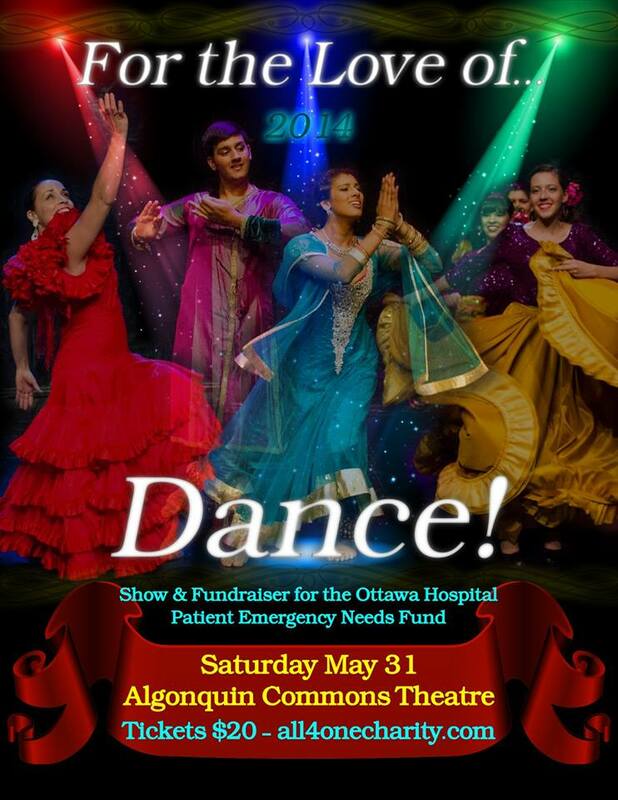 Saturday, April 2nd, 7:00 – 9:00 p.m. at the Knights of Columbus Hall, 260 McArthur Ave. An evening of eastern entertainment – bellydance and bollywood. 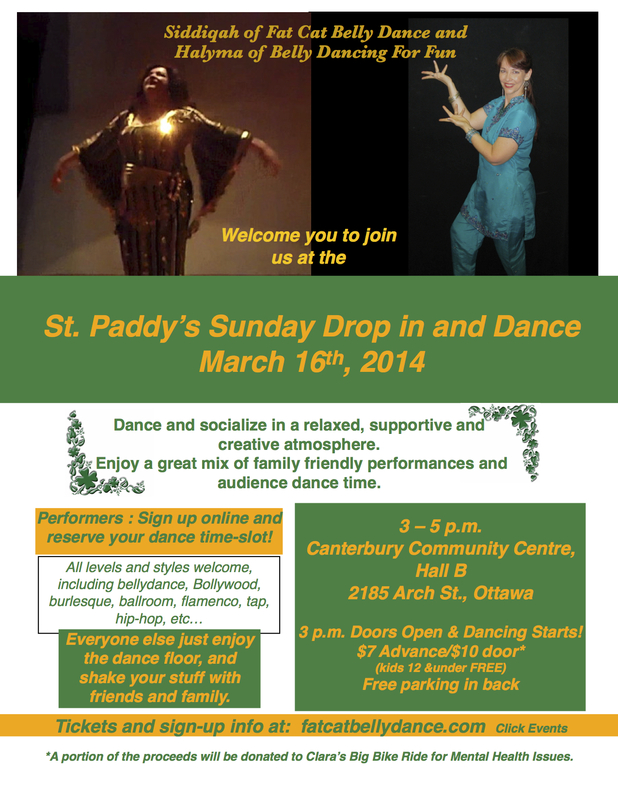 Performances by professional and emerging dancers. 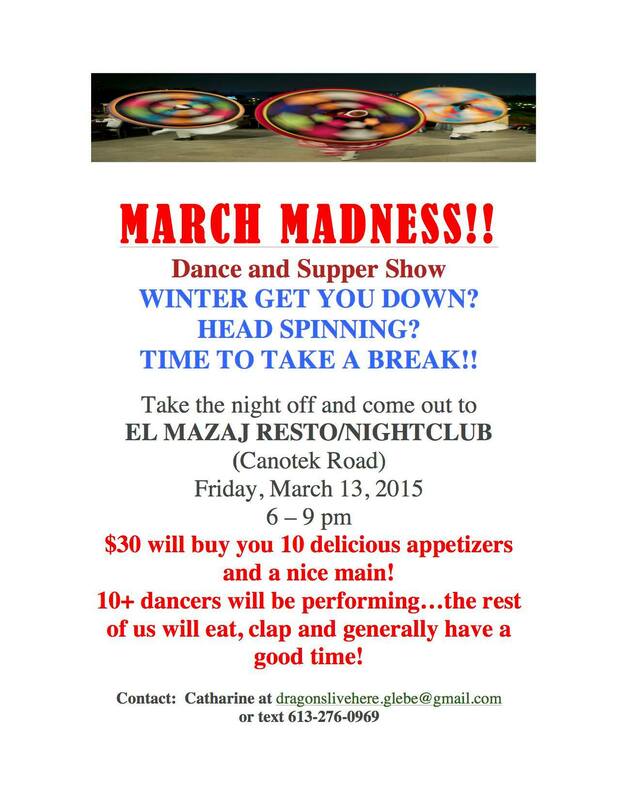 Middle Eastern epicurean delights, raffles for prizes, and plenty of fun. Tickets $25, and available at www.halyma.com/show, or contact me at fatcatbellydance@gmail.com Check out the event on Facebook! Look for Treasured Chests Walking Team Fundraising Evening. ************************************************************ During 2010, I had the pleasure of performing at a variety of outdoor venues, rain or shine, with my dancing friends, for local charitable events. These included the Hike For Hospice at May Court, the Ottawa Marathon, the Weekend To End Womens’ Cancers. and the grand re-opening of the Museum of Nature. Photos from these events are posted in my gallery. Other events included teaching a private lesson to a lively group of ladies celebrating a bridal shower in Orleans. No photos from that event…what happens at a shower, stays at a shower! 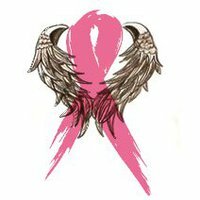 I was invited to perform a solo at a local fashion show for breast cancer survivors, hosted by Sherry, owner of the Wholesale Outlet. I was also proud to be asked by Halyma to join the Belly Dancing For Fun group to participate in a show for residents at the Montfort Long Term Care Facility. So far in 2011, I’m planning a class recital at Canterbury Community Centre on Friday, March 25th, so all my students can show off their stuff to family and friends, with a few special guest performers. All that hard work deserves a party! 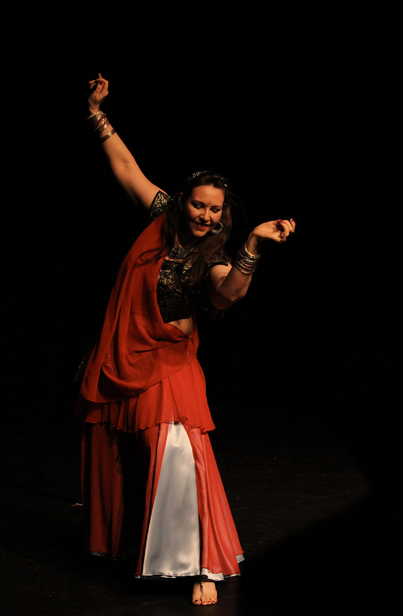 Looking forward to participating in various dance events this spring, and will keep you posted!